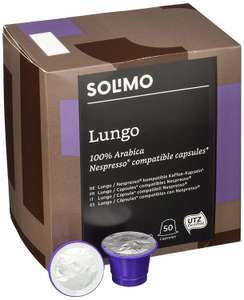 First post: if you have Amazon Prime, you'll get 100 (2 x 50) of these Nespresso* Compatible Lungo capsules for £7.93, working out at just 8p per capsule, best I've seen in a while. Original price is £16.00. Not sure how long the offer is on for. Shame the Ristretto are double the price, Amazon should really offer free samples if the minimum you can buy is 100. Got these a few weeks back - they’re not bad at all, especially at this price. A bit weak for my liking so I’ll keep an eye out for stronger ones from the same range. Got these a few weeks back - they’re not bad at all, especially at this p …Got these a few weeks back - they’re not bad at all, especially at this price. A bit weak for my liking so I’ll keep an eye out for stronger ones from the same range. Are these the plastic type that don’t pierce properly and trickle out of the machine slowly? Are these the plastic type that don’t pierce properly and trickle out of t …Are these the plastic type that don’t pierce properly and trickle out of the machine slowly? Other half got a gusto machine, so doesn't look like these pods are compatible. Must say, I dont find any of the pods taste particularly nice, especially considering the extortionate profits they are making. Its just taste like cheap coffee, cappuccino, etc. I’m in subscribe and save with these. They’re ok actually. Not as good as nespresso but a fraction of the price and perfectly drinkable. Make a subscription to the product with code SNS20 and get 20% off this already discounted price (then cancel the subscription order). Should work out under 6p per pod! Excellent deal! Make a subscription to the product with code SNS20 and get 20% off this …Make a subscription to the product with code SNS20 and get 20% off this already discounted price (then cancel the subscription order). Should work out under 6p per pod! Excellent deal! Odd, perhaps it's account specific... With amazon prime doing the recurring subscription service. Deal posting newbie! This is gerriohear first deal post. Help out by leaving a posting tip or just to show your appreciation for their contribution.